Mormon trailblazer became a best-selling author who confronted real problems in a personal way. Tribune file photo Chieko Okazaki, a member of the General Relief Society Presidency of The Church of Jesus Christ of Latter-day Saints from 1990-1997, died this week at age 84. On best-selling Mormon author Chieko Okazaki's 84th birthday in October, her family reluctantly moved her to an assisted-living center. When she blew out the candles on a cake the family had provided, the frail and gray-haired grandmother said her birthday wish was "to get to know each and every one of [the residents]," adding that she was "so grateful" to be there and to have "all these new friends." Gratitude in the face of health setbacks, loss of independence and an uncertain future is rare, but "a classic Chieko response," recalled Carol Lee Hawkins, a longtime friend who was with her at the time. "At every turn, she was totally at peace." On Monday, Okazaki  a popular speaker, master teacher and the first non-Caucasian woman to serve in an LDS general presidency  died of congestive heart failure in Salt Lake City. With her death, the Utah-based faith has lost "a uniquely powerful voice," said Kathleen Flake, a friend who teaches religious history at Vanderbilt in Nashville, Tenn. "She accomplished that by being fearlessly honest about herself and the problems that members of the church faced." 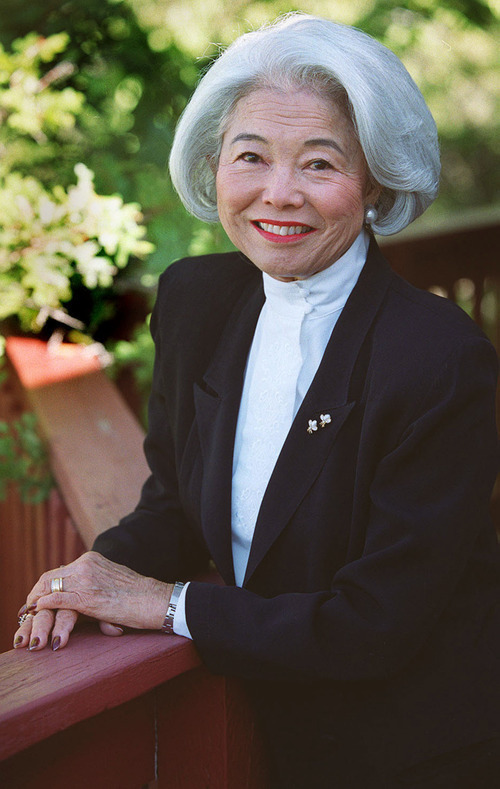 Okazaki, who served as first counselor in the church's General Relief Society Presidency from 1990 to 1997, was one of the first speakers to address, in a church setting, the question of sexual abuse, Flake said, and to discuss balancing work and family; homosexuality; blended families; and coping  as she had  with racism. "She took real and pressing problems and not only comforted," Flake said, "but led women in how to constructively engage those problems using the resources of the gospel." She did it all by turning everyday items and experiences into powerful metaphors  a crazy quilt, a piece of rope, a "cat's cradle" string, left-side driving rules  that formed the centerpiece of her sermons. Her first collection of speeches, Lighten Up, sold more than 100,000 copies. She went on to publish at least five more volumes, becoming one of the most-read LDS authors in history. Physically, emotionally and spiritually, Okazaki "roamed everywhere," Hawkins said. "She had an ability to go where others didn't, to see past limitations and boundaries to ask deep questions that helped people see through silliness or traditions." And she did it all with an unfailing optimism that created sermons out of sorrows, many of them her own. Okazaki was a convert to The Church of Jesus Christ of Latter-day Saints who married a non-Mormon, experienced infertility, faced racial discrimination, endured bouts of breast cancer and lost her husband. She was born in 1926 to Japanese laborers on a plantation on the big island of Hawaii. As a Buddhist, a young Chieko followed many of that religion's traditions. She faithfully put fruit and rice on the family's shrine each day. She recited prayers with beads draped over her hands. When she was 11, an LDS missionary couple offered a class on Mormonism at her school. She often had seen the church's chapel behind the school and wondered about it. The class coincided with her study hall, so she and three friends enrolled. "It was a different experience,'' she told The Salt Lake Tribune in 1996. "I was used to shrines and incense and gold brocade materials. This was just plain, nothing there except listening to the gospel." Okazaki continued to go to the Mormon meeting every Wednesday for four years and also to Sunday services. She enjoyed being both Mormon and Buddhist, but eventually joined the LDS faith at 15. Okazaki's parents were set on her getting an education. They worked extra hours in the fields and made slippers to send her to the University of Hawaii. There, she met Ed, a World War II veteran. He was a Congregationalist, which caused another dilemma: Should she marry outside her newfound faith? Ten months after their wedding, Ed joined the LDS Church. The couple moved to Salt Lake City in 1951 so he could pursue graduate studies in social work at the University of Utah. Okazaki worked at Uintah Elementary on the city's east side. There the couple faced discrimination against those of Japanese descent. Though she had never lived in Japan, Okazaki was associated in the minds of some Utahns with "the enemy.'' Three mothers refused to allow their children to be in her kindergarten class. "I made a fuchsia-colored dress that showed off my skin and black hair and tucked a fuchsia flower in my hair," she wrote years later. "I was the most vivid thing in the whole school that first day. ... What I wanted the children to feel was my own joy and excitement." By the end of the day, the three mothers wanted their kids back in. Because of medical conditions, Okazaki had only two children, Kenneth and Robert. She continued to teach school in Utah and later Colorado, eventually becoming a principal. In 1961, she became the first non-Caucasian to be on the church's Young Women's Board. Seven years later, she joined her husband when he served for three years as an LDS mission president in Okinawa, Japan. A few years later, she was asked to work on the LDS Primary Board, which oversees the religious education of Mormon children. She was there until her appointment in 1990 to the Relief Society Presidency. Okazaki then became highly visible. Typically bedecked in striking colors and often wearing a Hawaiian lei, she would call out to her all-female audience, "Aloha," and thousands of women would answer back, "Aloha." She even gave that unconventional greeting during LDS General Conference. Her speeches were tightly woven masterpieces that she worked over for weeks and refined continuously. She then read and reread them, practicing each word so it sounded natural and fluid. Every speech was a teaching moment, recalled Elaine Jack, the Relief Society president who chose Okazaki as her counselor. "She used words and examples so judiciously to make a good and memorable point." With her light touch and subtle humor, she was able "to bring religion down to earth," said Okazaki's son Kenneth. "She inspired women to have a backbone." And, after her two sons were grown and her husband died in 1997, the gentle mother turned her nurturing attention outward to the world. She visited mobile homes and nursing homes; she spoke in tiny branches in Africa and big conferences in Australia; she found women who felt lost or alone. Her reach was global, even as her approach remained individual. "Every trial she had  including cancer, widowhood and prejudice  she consecrated to the good of others," Hawkins said. "She saw them each as a gift to be able to connect to other people  and to the Lord." "Perfect people don't need a savior. He came to save his people in their imperfections. He is the Lord of the living and the living make mistakes. He's not embarrassed by us, angry at us, or shocked. He wants us in our brokenness, in our unhappiness, in our guilt and our grief." "Adversity is frequently a call to do something great with our lives." "Again, look around the room you are in. Do you see women of different ages, races or different backgrounds in the [LDS] Church? Of different educational, marital and professional experiences? Women with children? Women without children? Women of vigorous health and those who are limited by chronic illness or handicaps? Rejoice in the diversity of our sisterhood! It is the diversity of colors in a spectrum that makes a rainbow. It is the diversity in our circumstances that gives us compassionate hearts. It is the diversity of our spiritual gifts that benefits the church."